Looking back through the pantheon of automotive side stripe packages is a great way to get depressed by the state of current side stripe offerings. Every decade has some pretty awesome options, and the current lineup pales by comparison. The 1960s were pretty definitively the era of racing-style stripes, but a few companies had the balls to put some stripes on the side of the car. The ‘70s saw a boom in side stripes, and produced perhaps the best example ever in Plymouth’s AAR Cuda, and Porsche was putting Martini Racing stripes on damn near everything. There was a side stripe boom in the ‘80s that lasted through the early ‘90s. Then the import tuner scene took over and put graphics, stripes, decals, and images on every available surface. The ‘80s were great for stripe enthusiasts. Everything from sports cars to off-roaders had incredible stripey good looks. Toyota was proudly displaying a wide variety of stripes on their 4Runner, even. There was a serious lack of stripe packages from the factory in the 2000s, and that trend hasn’t yet reversed. Back in the ‘80s, brands would put “Turbo” on everything, including things that didn’t have turbos. Now practically everything has turbos, but car companies are keeping it a secret. What used to be a marketing boon is now hush hush. Owners should have the option to say it loud and proud with a stripe and decal package dealer add-on. Today, stripes are available on a handful of Ford performance models, super expensive Porsches, and that weird yellow stripe on Mercedes C63 S.
A friend of mine, Lane Skelton, is a graphic designer by trade. I asked if he would help me develop a 1990s-inspired side stripe set for my off-road Audi S6. Audi’s large turbocharged sedan of the 90s was a relatively staid design, differentiated from its lesser stablemates by bumpers and a small fender flare. For this ridiculous project, it needed something to push it that extra step. The design brief Lane and I came up with was inspired by Volkswagen’s Golf Country graphics package of the early 1990s. 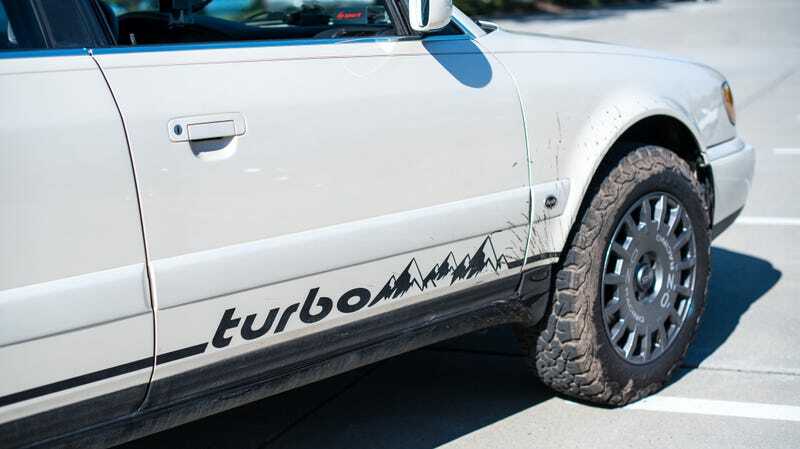 He developed a mountain-and-turbo graphic with a simple stripe that I instantly loved. We had them cut, and I installed them over the course of a frustrating couple of hours in my back yard. In my case, the side stripes were just the right touch of rad to push it over the edge of awesome in my eyes. There are a lot of cars on the market today that need just a little extra visual oomph. It doesn’t take much to do it yourself, and vinyl cutters are cheap. Make your own!